Much of a rug's value will be determined by the knots per square inch, but determining the number of knots per square inch is difficult, because it has to do with whether the knots are tied in the same plane or not. When knots are tied on the same plane, one knot appears to be two on the back of the rug. If the knots are tied on two planes, each bump or node counts as one knot. To count the knots, look at the colors. A one-color node is one knot; with dually colored nodes, count two nodes as one knot. Typically, rugs are made from wool, silk, and cotton, with wool being the most commonly used material. It's not unusual to see lanolin-rich New Zealand and South Korean wools mixed with local wools to create the majority of the rug. The addition of these wools make the rug stronger and more supple. Silk is used more sparingly as an accent because it is so much more costly and not as strong as wool. If the price tag on a purportedly silk rug is unbelievably low, it likely is made from rayon or cotton. Cotton will sometimes be used to create the foundation, but it can't be seen in the pile. Use a burn test to determine fabric content. Ask for a strand from the carpet and burn it. Wool will extinguish itself. Silk will smell like singed hair, while cotton and rayon will have the scent of burning paper. When all three of these materials--wool, silk, and cotton--are expertly combined, the result is a gorgeously strong carpet. This built-in strength in a hand-knotted rug gives it a long life and great resistance to high traffic, with wear showing only after a couple of decades under the most intense of usage conditions--such as in a hallway, great room, or entranceway. When a hand-knotted rug is located in a medium-traffic area, such as a dining room or home office, or a low-traffic area, such as a bedroom, it will yield even more years of life. On the loom, the warp threads run vertically and become the rug fringe. The weft threads run horizontally and create the selvedges of the rug--the edges that hold the rug together. When the loom is threaded, the weft threads weave in and out of the warp threads, and this creates the foundation of the rug. The wool or silk strands are tied by the artisan to the warp threads, then cut, knotted, and tightened. It takes an expert weaver about two seconds to make each knot or about a thousand knots an hour. Weavers follow a diagram or cartoon to create the patterns and colors of a rug. The cartoon is drawn on graph paper with one knot per square. Exceptionally experienced weavers will rarely refer to the cartoon. There are many different knots utilized for making a hand-knotted rugs, with the Persian knot being most common. The knots vary by region and are passed down from generation to generation. Expert artisans are sought after and are known for their style of knot. Once the rug is knotted, it is hand-carved or embossed. 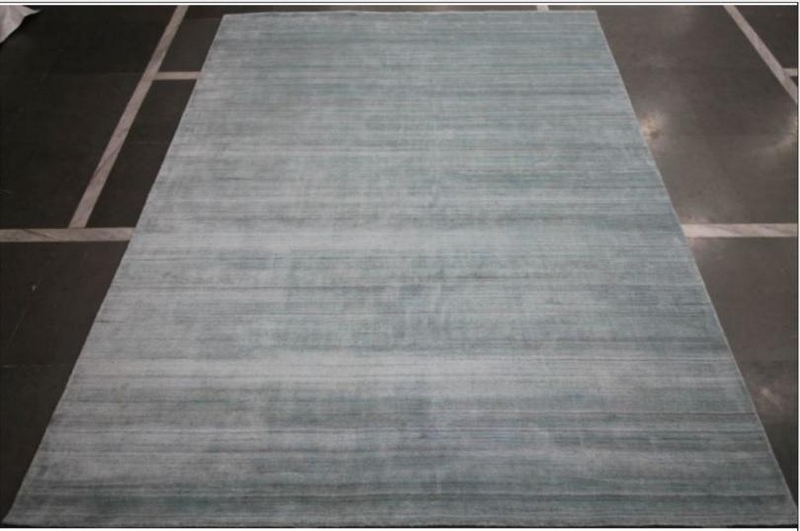 This involves shearing parts of the rug to create a three-dimensional effect, and is done to emphasize the rug's design. Only the most skilled artisans can perform this difficult work. The owner of a hand-knotted rug has the pleasure of possessing a one-of-a-kind work of art that will become a family heirloom to last for generations. However hand-knotted rugs are pricey, and their age, origin, and content can be difficult to determine. To truly get a quality hand-knotted area rug, you will want to work with an expert and experienced rug vendor such as The Rug Warehouse. With a trusted adviser, you can be certain to secure a valuable hand-knotted rug to last a lifetime and longer. Please visit the Rug Warehouse website or our Los Angeles showroom to view our outstanding collection of hand-knotted rugs and to work with an expert professional to choose an exceptional hand-knotted rug for your home or collection. Good article, it is very necessary to know how a hand knotted rugs is created before to purchase it. Amer Rugs manufactures beautiful designer hand knotted rugs in USA and also tells how they manufactures hand knotted rugs by video.